sandra piesik is an architect and a researcher specializing in technology development and transfer. 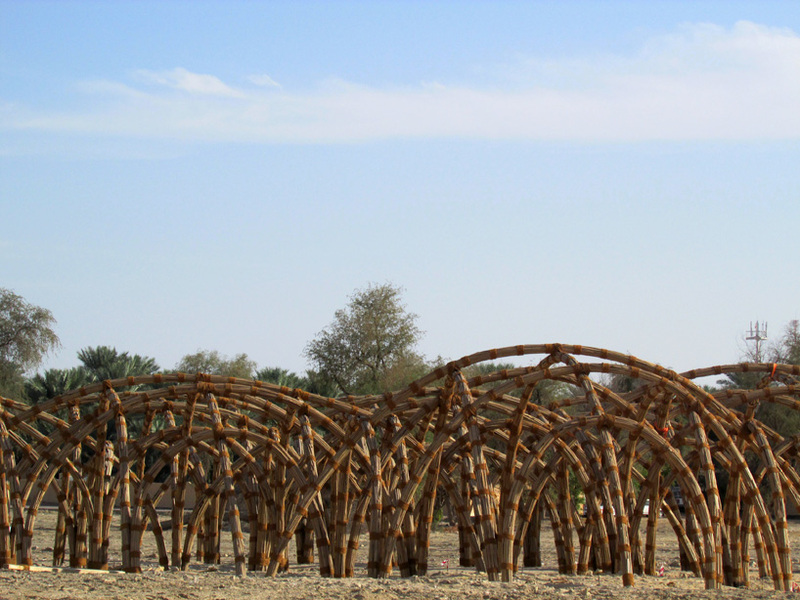 she has worked extensively in the middle east on projects that reconnect traditional knowledge systems with modern applications, and has led successful research, development and deployment studies on the adaptation of date palm leaf architecture for modern use, which resulted in an award-winning project endorsed by the UNCCD and the book 'arish: palm-leaf architecture'. as the founder of several multidisciplinary research groups and consortia, she is actively engaged in addressing global climate change. she was co-creator of the urban and rural resilience programme for desert regions and participated in the COP22 UN climate change conference in marrakech. 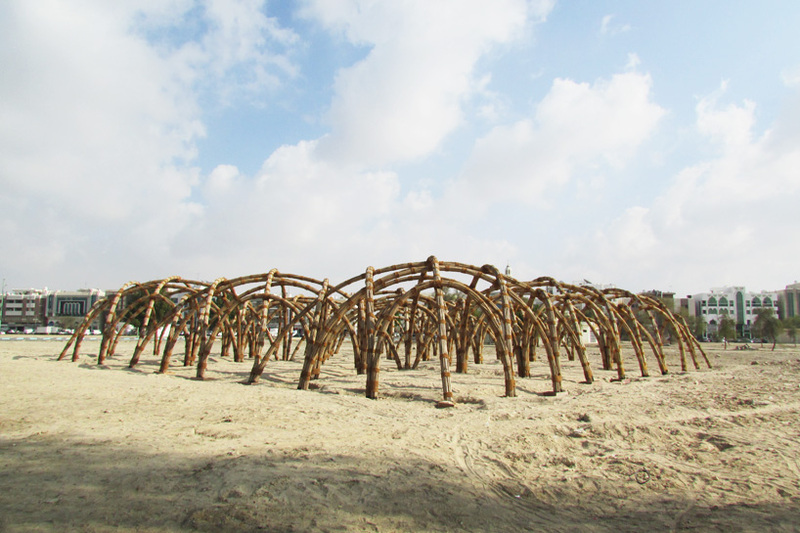 owing to fundamental shifts in both economy and culture, palm leaf buildings seem to have fallen out of fashion. 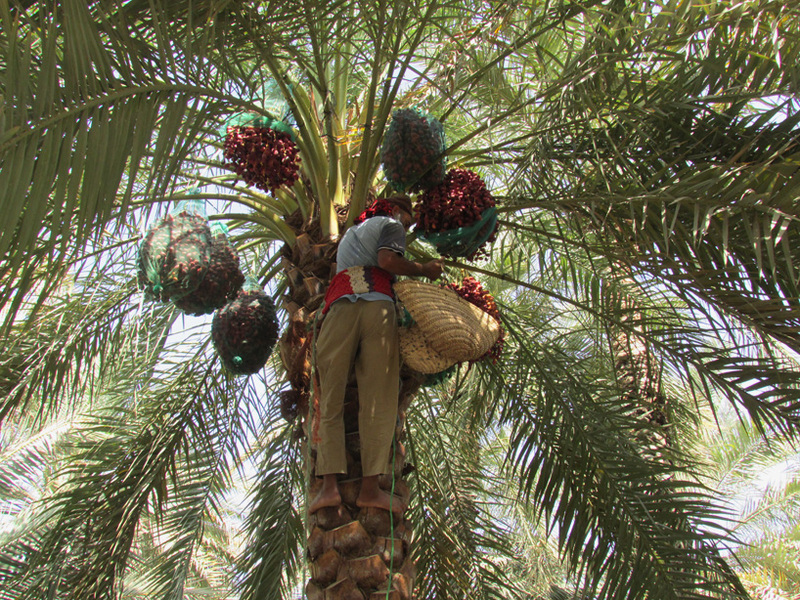 in an attempt to reintroduce lost traditions, the united nations convention to combat desertification (UNCCD) is endorsing use of these long-established technologies in order to tackle climate change and alleviate poverty. 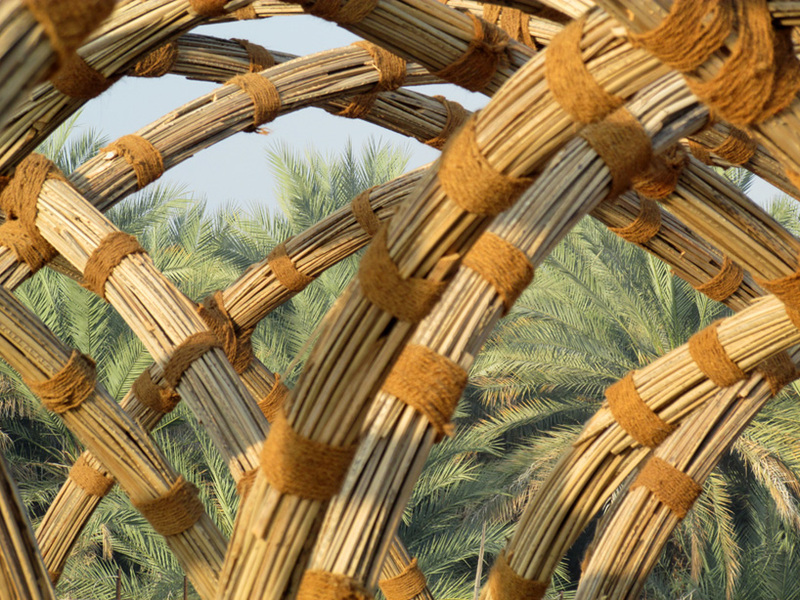 according to dr sandra piesik from 3 ideas limted – who is using palm leaves to create a sustainable solution to store food at the UAE’s al ain UNESCO world heritage site – revitalizing old conventions using modern innovation could be key in helping to combat future climate change. 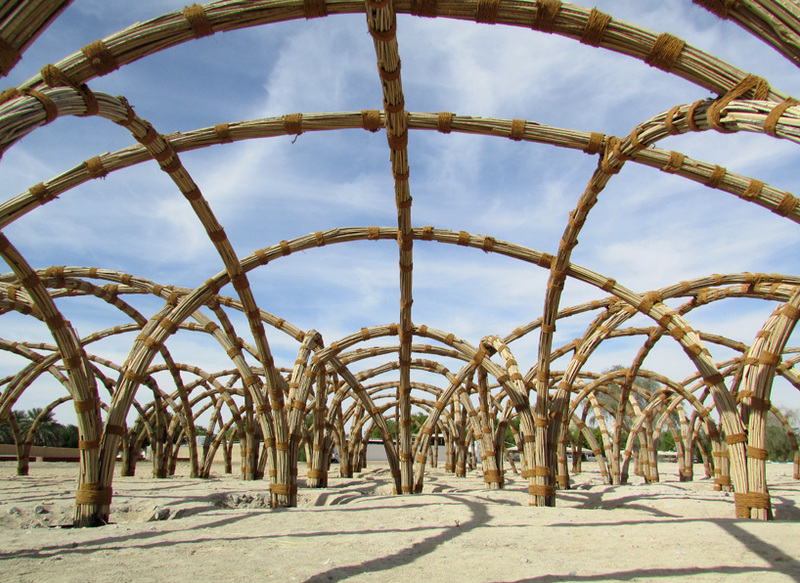 ‘with traditional renewable resources for building materials readily available in more economically challenged regions, people could continue using them also today for construction of structures to meet local needs including food shelters, schools or local clinics’, explains sandra piesik. ‘this is an issue being discussed by UNESCO and UNCCD as we speak. the difficulty is applying indigenous techniques to a culturally developed world’. 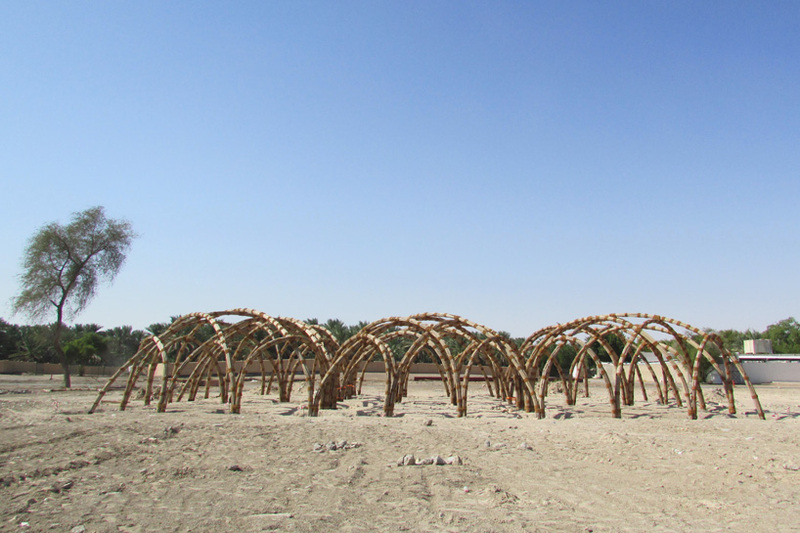 developed alongside the TCA al ain historic environment department, ‘the food shelter’ (locally called ‘the sabla’) is a humanitarian project designed to contribute to social development programs in poorer countries where date palm trees are cultivated. the scheme aims is to utilize the leaves, which would normally be discarded, as a way to address the problem of food being wasted due to lack of adequate storage. 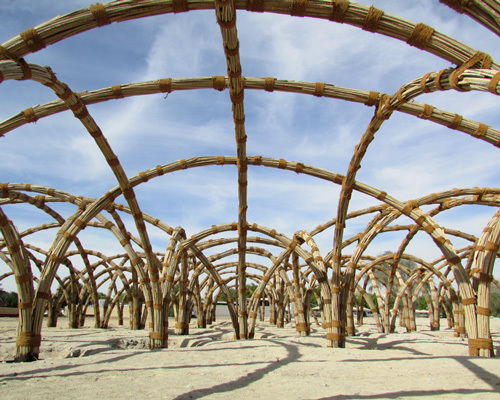 the new shelter is the result of a six year research and development program set up to demonstrate that combining traditional materials with modern techniques can deliver cost effective, quick, and environmentally sustainable solutions. 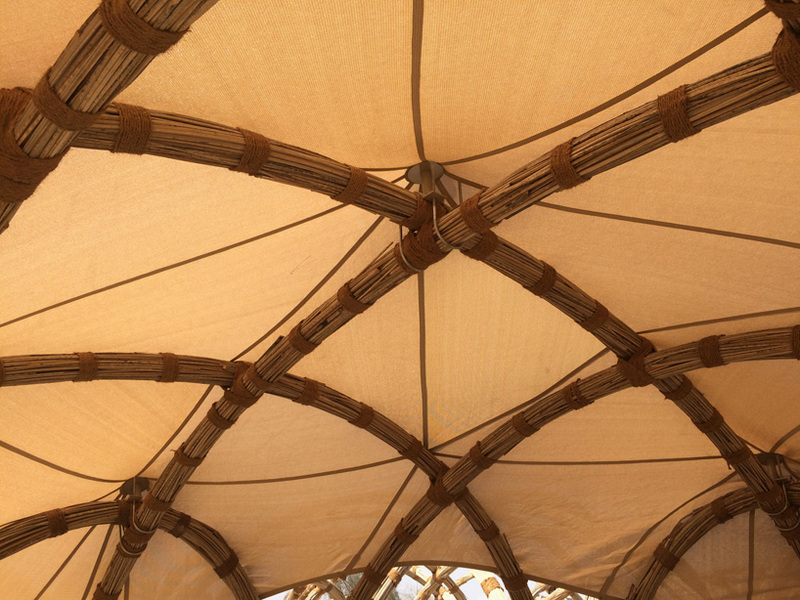 3 ideas ltd and the buro happold engineering team carried out extensive research in the use of palm leaves, and constructed trial structures, prior to designing the arched gridshell frame. 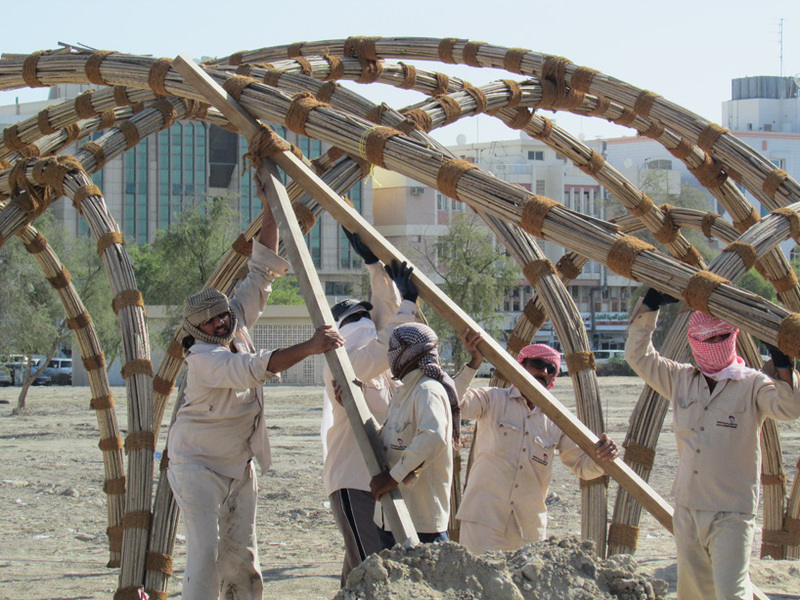 as well as using locally sourced materials, the traditional arish technique has been modified in order to bundle the palm leaves together; they are then lapped to form long circular shaped sections that can be curved into arched profiles to form structural members for the gridshell frames. the final output is a modular construction of nine 8m x 8m modules which provides a total shaded area of over 600 square meters. 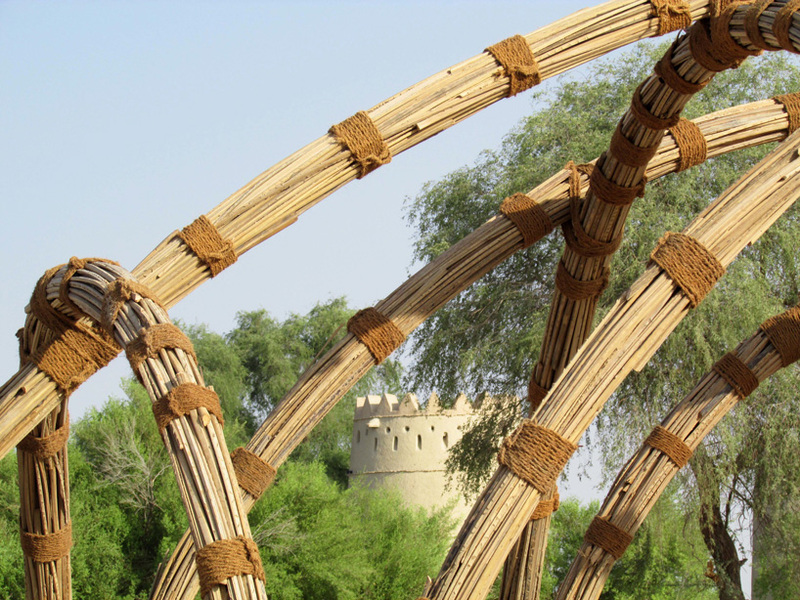 in order to modernize age-old aesthetics and foster the continued use of date palm leaf (known in some regions of the UAE as arish), a tensile roof fabric covering is being proposed. 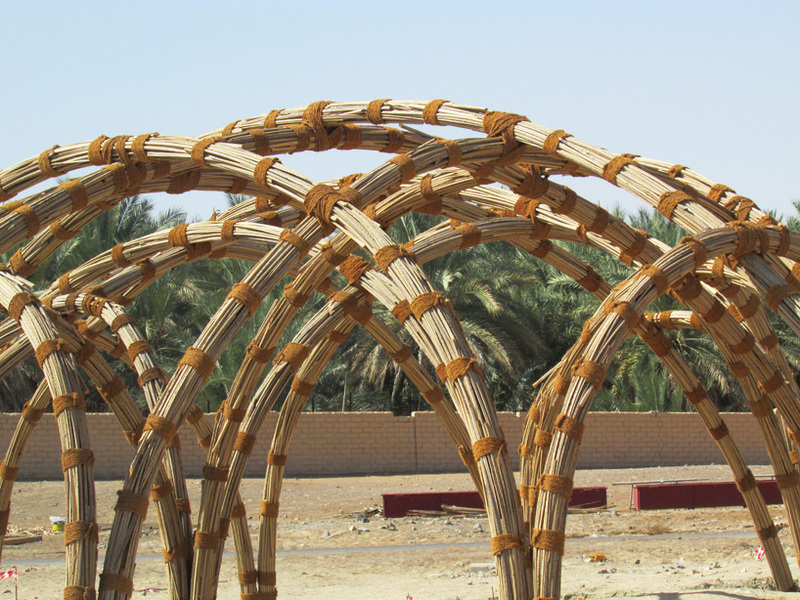 this will to be the first date palm leaf building with the use of tensile fabric for the roof covering. 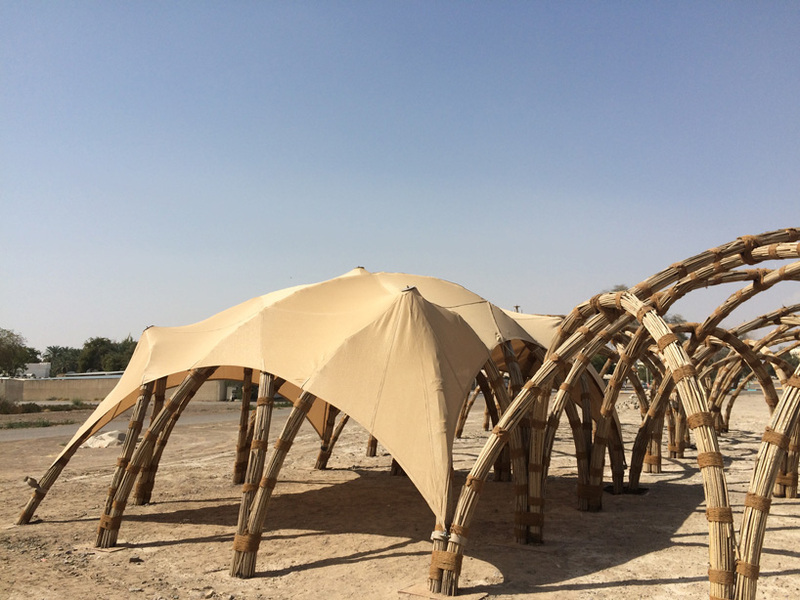 it is hoped that the new structure at al ain will be just the start of an initiative to bring back traditional methods and materials as solutions to very modern issues across the middle east and beyond.